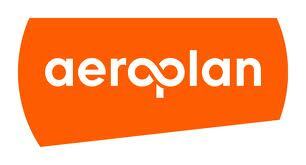 Donate your Aeroplan Points here. Our feature in Snapd showcasing the Flight to Do Right Beer Pairing fundraiser! 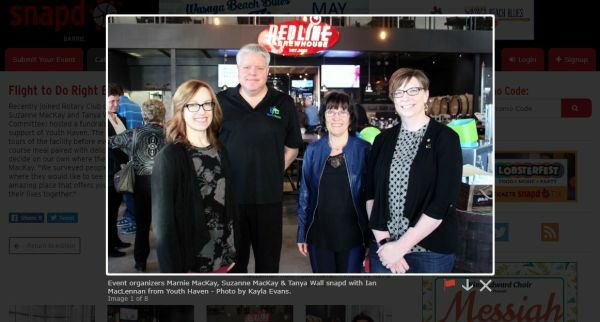 Recently joined Rotary Club of Alliston members Marnie MacKay, Suzanne MacKay and Tanya Wall (also known as the Newbie Committee) hosted a fundraising event at Redline Brewhouse in support of Youth Haven. The evening featured guided brewery tours of the facility before everyone sat down to enjoy a four-course meal paired with delicious craft beer. "We didn't want to decide on our own where the money should go," said Marnie MacKay. "We surveyed people within the community to see where they would like to see the funds go. Youth Haven is an amazing place that offers youth shelter, and a safe place to get their lives together." See more pics of the event HERE! Dave and Paul working hard at last year's Highway Cleanup. Join us for Highway Cleanup on Monday, May 6th at 6pm. The following is a thank you letter from Banting Memorial High School for Rotary's support of their trip to Europe. On behalf of the Banting staff and students that participated in the D-Day trip, we would like to thank you for your generous donation in support of our adventure. Your contribution helped 73 students experience key events in Canadian History and bring the lessons that we learn in our classes, come to life. The trip encouraged appreciation for the significant sacrifice that was made, on our behalf, by the thousands of brave men and women who have served and continue to serve, in Canada’s armed forces. Additionally, our students gained through their exposure to cultures and histories different from their own. Our travels took us to war memorials at Omaha, Dieppe and Juno beaches, Beaumont Hamel, and Vimy Ridge. 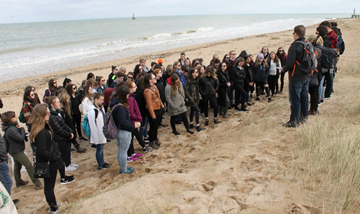 Students conducted ceremonies at both Juno Beach and Beny Sur Mer that were both meaningful and heartfelt. We visited Tyne Cot Cemetery and the memorial at Menin Gate. Students were impressed with the hardships soldiers faced during a tour of the Wellington Quarries in Arras. I have attached pictures of a few of these experiences. In addition to the memorial experiences, students also had the benefit of touring the Palace of Versailles, medieval Bruges, Ghent and Brussels and spending three days in London. 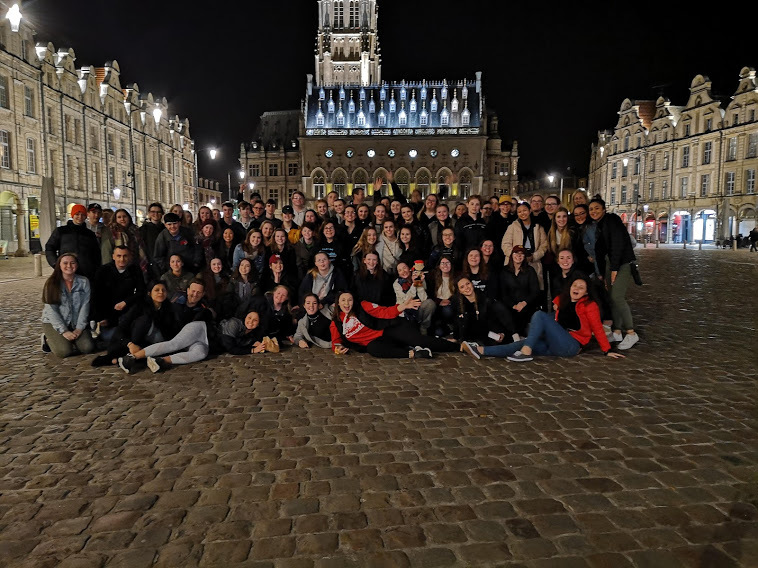 Several of our students fell particularly in love with the medieval centres in Belgium and along with the architecture and rich History, enjoyed the frites, Belgian waffles and endless chocolate. Thank you again for your contributions to this experience. The Banting community is enriched by the support it consistently receives from the wider community that embraces it. David Green and Joan Hayward were greeted with great enthusiasm when they visited the Life Skill Class at Banting Memorial High School. 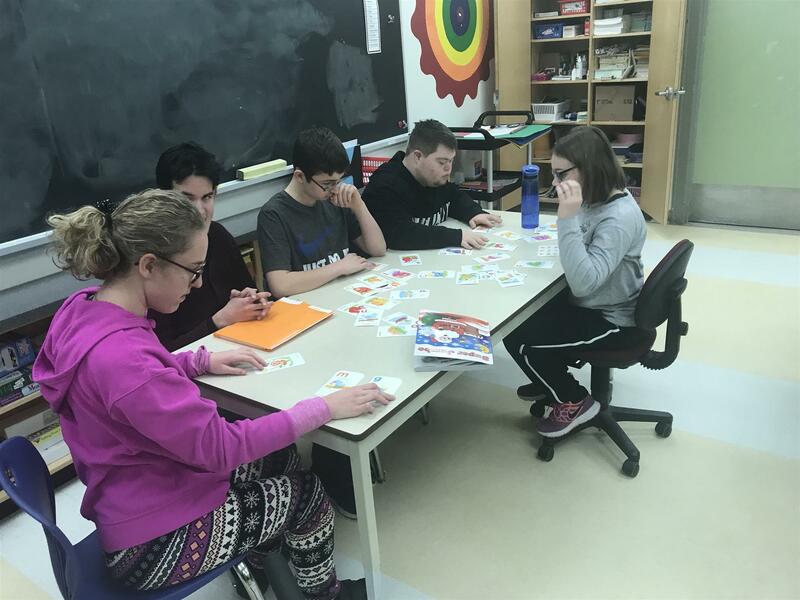 Student from the program were excited to learn that thanks to a donation from the Rotary Club of Alliston, they would be participating in a horse back riding program in April at the Hope Haven Therapeutic Riding Centre. The Rotary Club of Alliston provided $1500 to support the program. 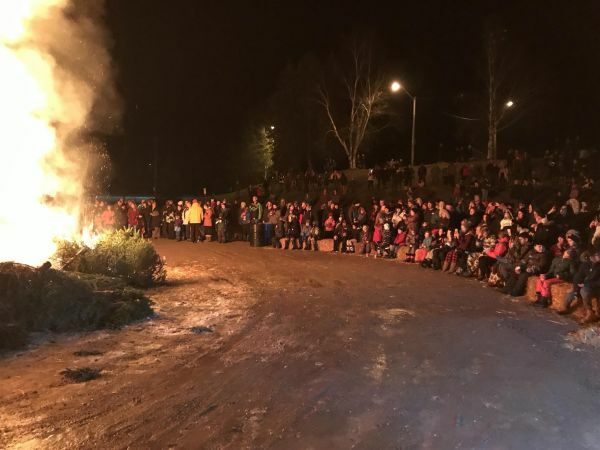 The Rotary Club of Alliston, the Firefighters of New Tecumseth and The Town of New Tecumseth had an impressive turnout at the Annual 12th Night Bonfire in Riverdale Park. 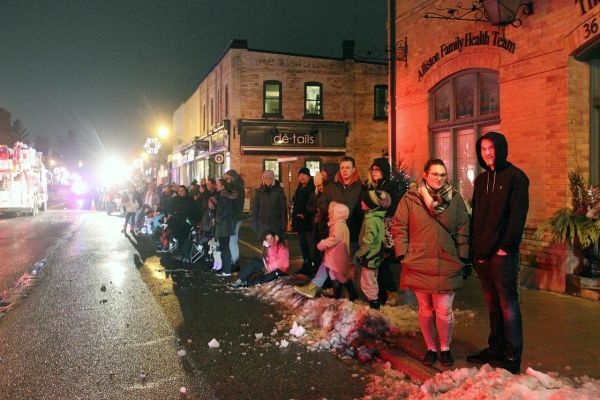 The massive bon fire was lit at 6:30pm and was viewed by hundreds as they feasted on hot dogs and hot chocolate. 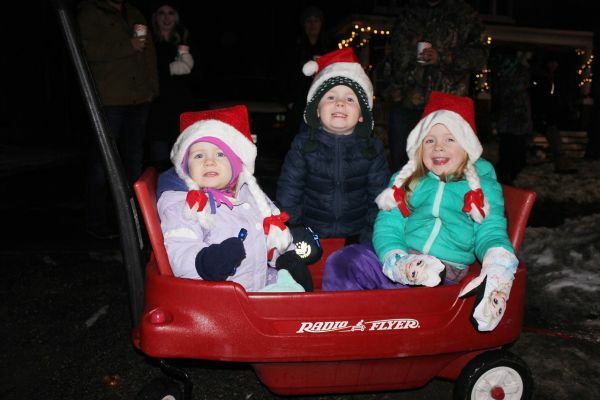 It was a hugely successful event thanks to all the volunteers, as well as, Country Meat Cuts for supplying the hot dogs and Tim Hortons in Angus for donating the hot chocolate. Also, a shout out goes to Sheldon Creek Dairy as for supplying bottles of chocolate milk to be handed out to all the children! 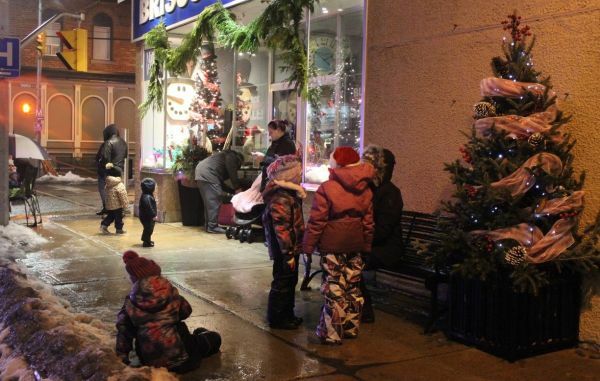 The Rotary Club of Alliston held its Christmas Party last night at the Gibson Centre. 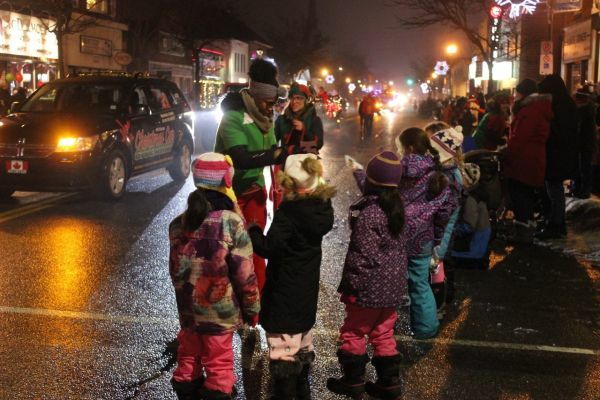 This year's recipient of donations is Alliston Out of the Cold. Jeni Pergentile, program director, is here with President Bill Wray accepting the donated items and money. Thanks to all who donated. Hi Bill and all the hard-working members of the Rotary Club of Alliston.. I send this note with my gratitude and because it's never too late to remember Canadian heroes. On Thursday, Dec. 6, at a short ceremony in front of Canada's only airworthy Lancaster bomber, at the Canadian Warplane Heritage Museum, in Hamilton, Ont., L/Col. Dean Black awarded the RCAF NORAD Trophy to me for my work researching/writing Dam Busters: Canadian Airmen and the Secret Raid against Nazi Germany - the book published by Patrick Crean Editions (HarperCollins). It was humbling and inspiring to see my book honoured this way. Even more important, the NORAD Trophy pays tribute to the 30 forgotten Canadians who flew this incredible mission 75 years ago this year. It's never too late to recount their stories, nor to remember their service and sacrifice. We will remember them. 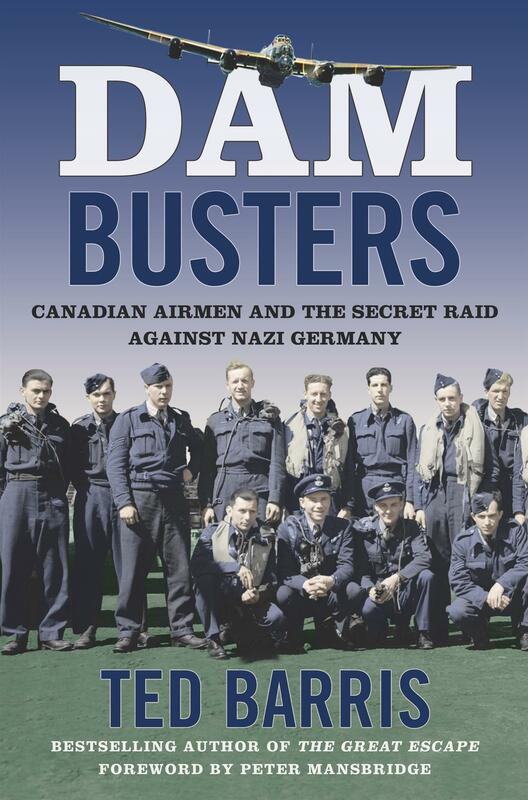 Again, my sincere thanks for inviting me and for your support for the Dam Busters' stories. With Ted's help the Rotary Club of Alliston raised $550 for the Alliston Legion Raise the Roof project...Thanks to all those who attended. Paul Foster, Joanne Waylen, Patricia Middlebrook, Janet Clayson, Colleen Kotnisz, Don Smith, Joan Hayward, Dave Green. 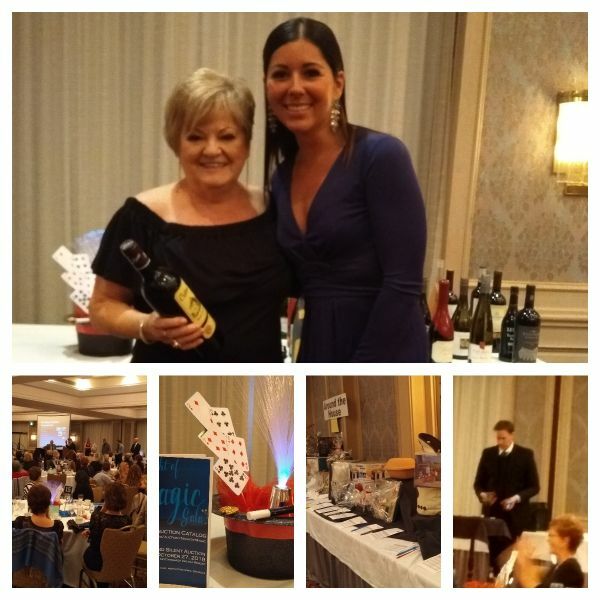 You all did a fantastic job and everyone who attended had a great time. The Rotary Club of Alliston and the Town of New Tecumseth celebrate End Polio Now Week in New Tecumseth, October 22-29, 2018. As a symbol of the commitment to eradicate polio world-wide, a ceremony was held recently to read the proclamation and to raise the End Polio Now flag. Polio is a virus that is transmitted through contact with human feces in contaminated food and water. Tests are done to determine the level of the virus in water associated with sewage treatment plants, canals and sewers. Immunization results when the virus is detected and when children show the early symptoms of the disease. The Rotary Club of Rivne has made significant progress in towards the goals of the global grant. 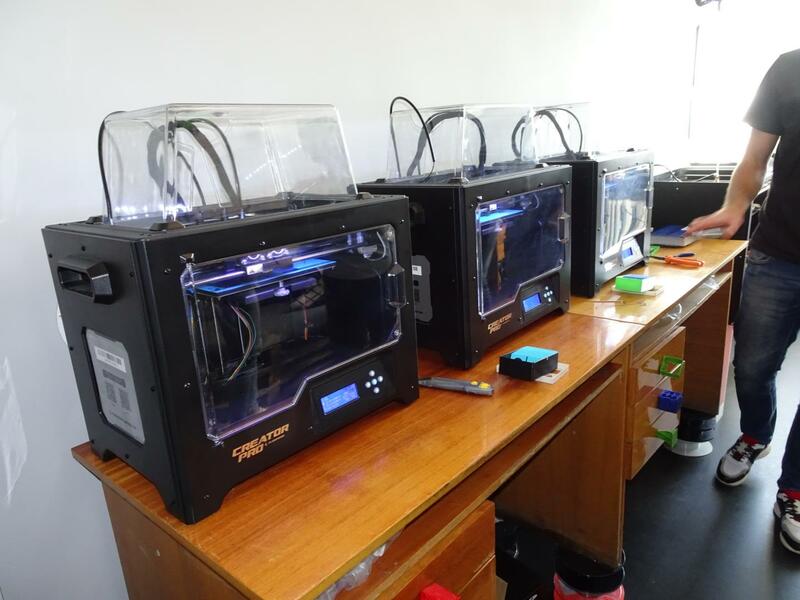 The 3D printing lab is up and running with hundred of piece of education equipment being produced. The technical team is continually evaluating the products and introducing new innovations. Boxes of these items lined the walls in the lab ready for delivery to the schools. Educatiom materials and support of education of blind and visually impaired students. Job creation for visually impaired adults. Three hardy Rotarians, Dave Green, Bill Wray and Roger Hayward make up this years team. We are in Rivne, Ukraine to audit the accomplishments of the global grant and talk with the Rivne Rotarians about their experience in implementing the grant and how they might move forward. Day 1: After a 4 hour drive we arrived in Rivne from Lviv. We were met by Ohla had lunch and were soon beginning our audit. The first visit was to the Rivne Association of Blind facility. Alliston Community Gardens on Elizabeth St. The Rotary Club of Alliston helped the Women’s Institute clear the Alliston Community Gardens this past Autumn in preparation for planting in 2018. 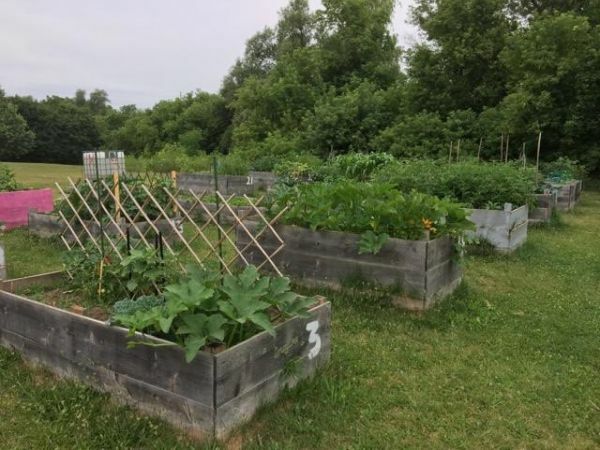 The raised boxes sit on Town of New Tecumseth property and any resident of Alliston can use the boxes to grow vegetables for their families. The town cuts the grass and provides water for the gardens. The Women’s Institute built the 29 boxes 3 years ago. All of the boxes are being used this season with a waiting list of 50 people. The Women’s Institute have plans to have more boxes built for 2019 season. Thanks to all the Rotarians who helped with this hands on project and thanks to Kelly McCague for the suggestion of some type of Garden project. For more information on the speakers and topics click HERE. 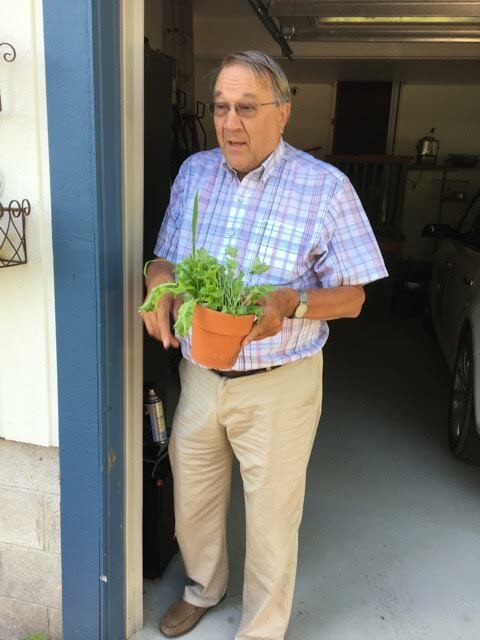 Rotarians Sue Leach and Jack Van’t Spyker have been helping with the garden this growing season. Jack has provided many plants from his own greenhouse. The food produced from this garden is harvested twice a week for the Good Shepherd Food Bank in Alliston. 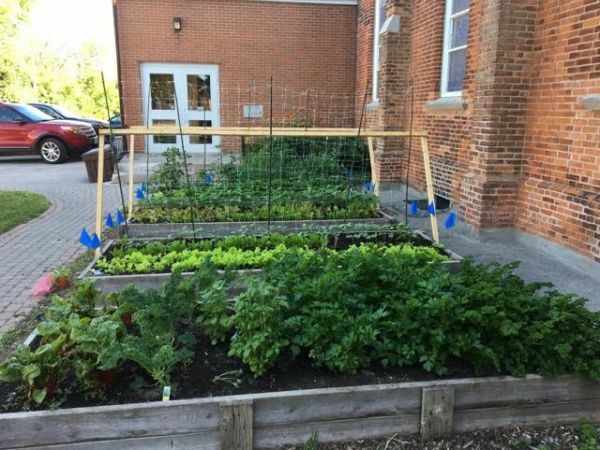 In the months of July and August the participants from the Community Living Association of South Simcoe(CLASS) will be helping water, weed and harvest on Mondays at 9:30am for about 30-60 minutes. If you would like to help out with CLASS in the garden, please contact Sue Leach at 519-217-2873. Jack Van’t Spyker with some Kale and Endive for transplanting. The Rotary Club of Alliston donated $700 to the Community Living Association of South Simcoe (CLASS). The money will be used as a sponsorship for their golf tournament to raise funds for the purchase of a new group home in New Techumseth. 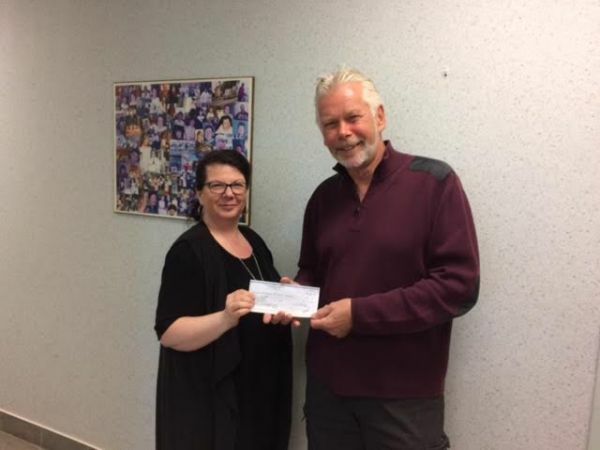 Rotarian George Scott presented the cheque to Nancy De Luca, manager of the fund raising committee. CLASS is still looking for Rotary friends and volunteers to assist with the tournament that is to be held on August 15th at the Nottawasaga Inn. 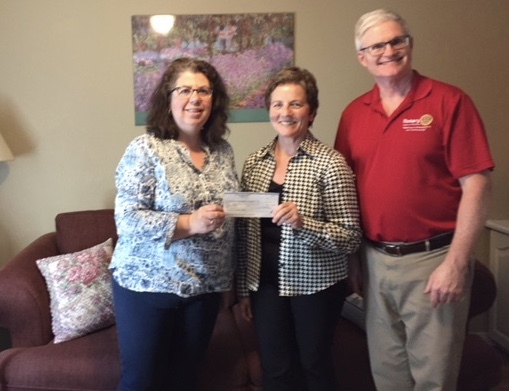 The Rotary Club of Alliston provided a $2000 towards the purchase of new beds and mattresses for My Sister's Place. Pictured above from left to right are: Deborah Herrington (from My Sister's Place), Kelly McCague and John McFarland. 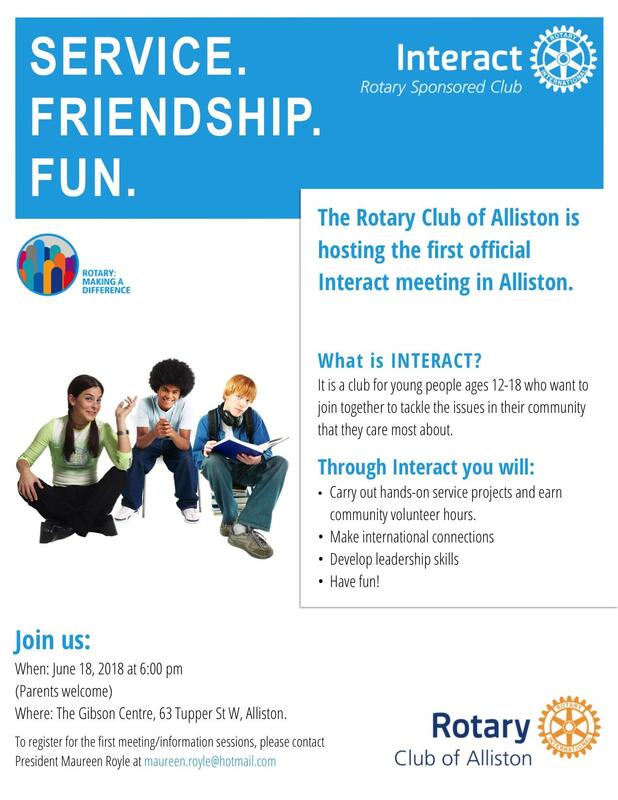 The Alliston Rotary Club welcomed and introduced our new Interact Club on June 11th at the Gibson Centre that was both informative and inspirational. 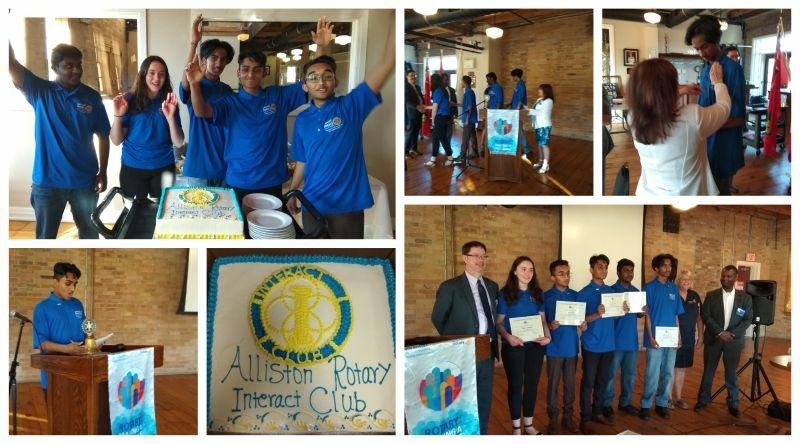 Speaches were given by District 7070 Interact chair: Patti Wright, District 7070 assistant governor: Sam Veerasingham, as well as the Interact President: Amzy Syed. 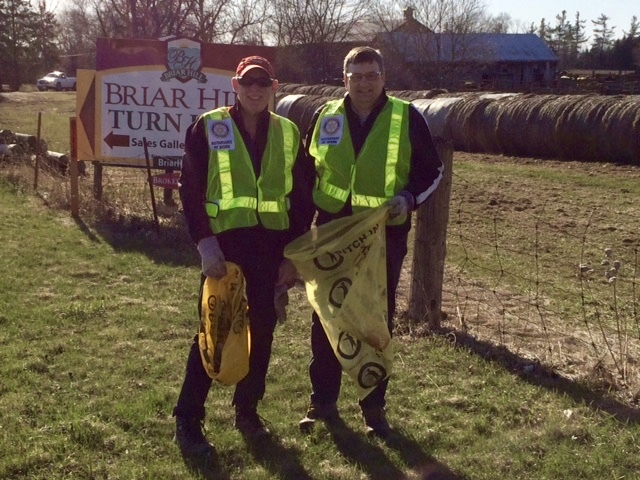 We had great weather and a great turnout of volunteers to help with the highway clean up. 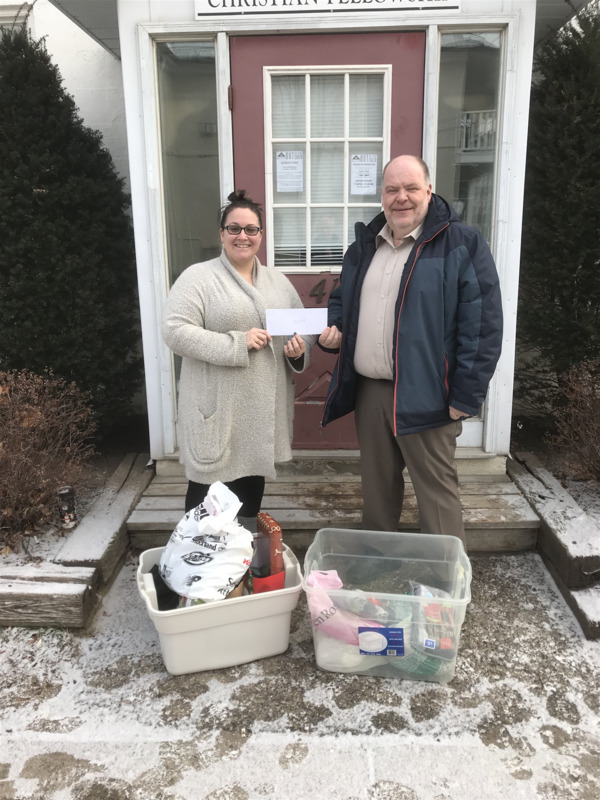 Thanks to Trillium Ford for letting us use their business as our base and the Town of New Tecumseth for picking up the many bags of garbage collected along Hwy 89. Thank to all the volunteers. Job well done. Pictured are Treasurer Irbaaz Syed, President Amzy Sayed and Secretary Emily. 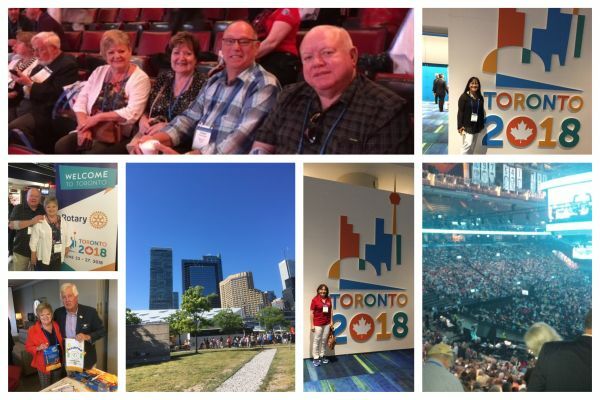 Would you like to be a Rotarian for 1 Day? 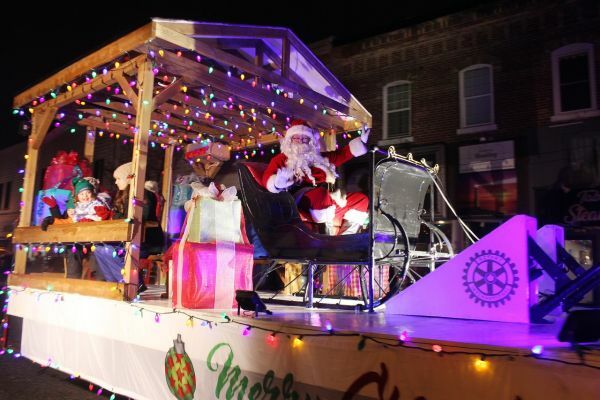 Alliston Rotary Club is offering 5 FREE PASSES to prospective members. Be the first to request your pass by sending your information to the email address below. As of now, we have over 35,000 registered attendees, from 180 different countries or geographical areas! As comparison - this is twice as many as the last convention in Canada, held in Montréal in 2010. We could not be happier. Would you Like to be a Rotarian for a day? 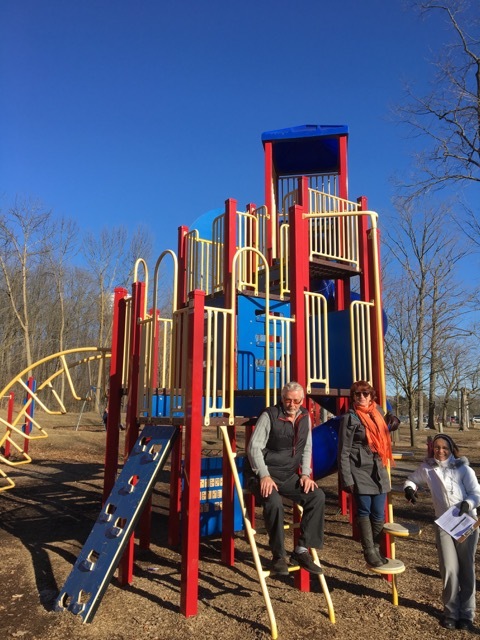 Rotarians review the status of the equipment at the Adventure Playground. The Rotary Club had enjoyed two meetings in the community in the last month. On March 5 the club enjoyed a visit and Tour at the Beatties Distillery and on March 19 the club met in Riverdale Park to tour the Adventure Playground and Splash Zone. The Rotary Club of Alliston has just been approved for a $65,500 US grant by The Rotary Foundation Canada and The Foundation of Rotary International for a project to focus on education and job creation in Ukraine. Last September Rotarians from Alliston visited The Rotary Club of Rivne, about a 3-hour drive from the border between Poland and Ukraine. Rivne is a 3-hours’ drive west of the capital, Kiev. Since Ukrainian independence from the USSR, little money has been available from the central government. The first part of the program deals with helping blind school-aged children learn Braille. 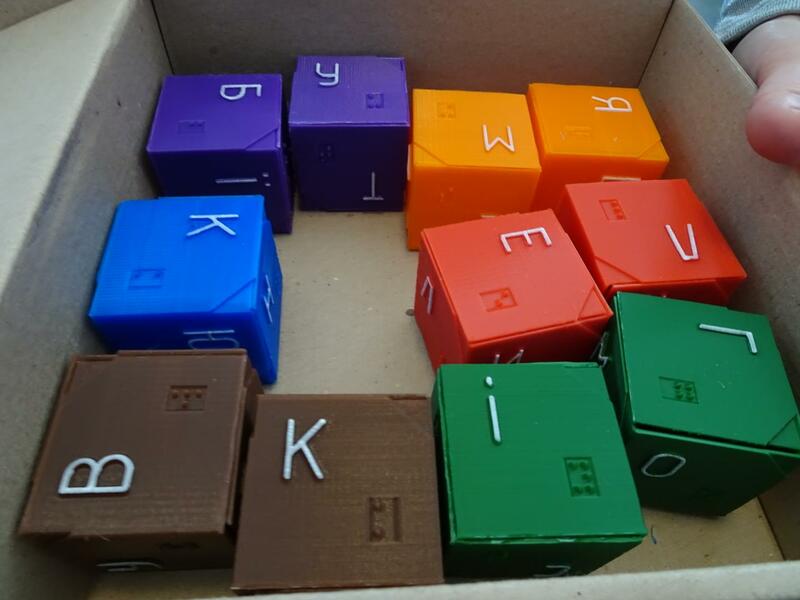 The Rivne Rotarians have developed a unique cube that allows young children to learn the Ukrainian alphabet and numbers through Braille. The school system is moving to an integrated program, accommodating all children with disabilities into regular classes, not unlike the Ontario model. 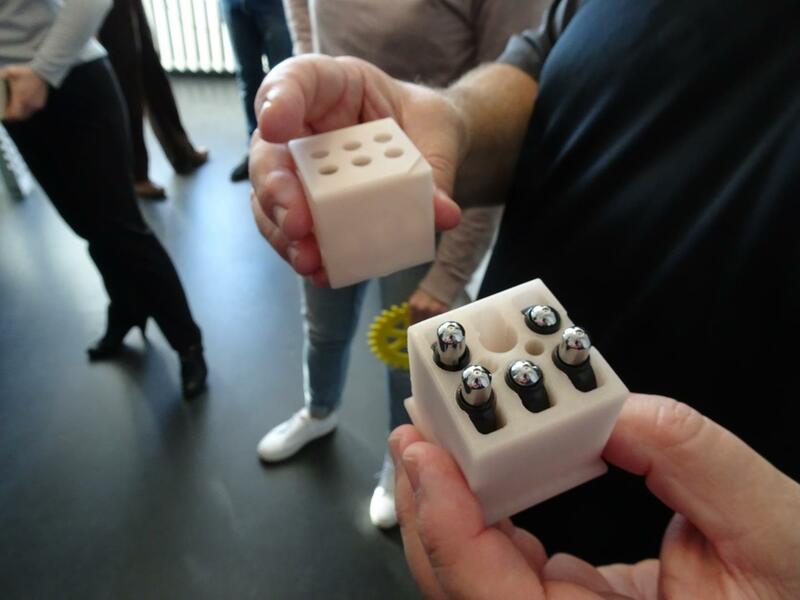 All children of school age who are blind will receive their own Braille cube and their teachers will receive training on how to use the cube with their students. At the same time this is happening, a small recording studio is being set up to make audio CDs of Ukrainian books to be distributed to local libraries in Rivne Province. 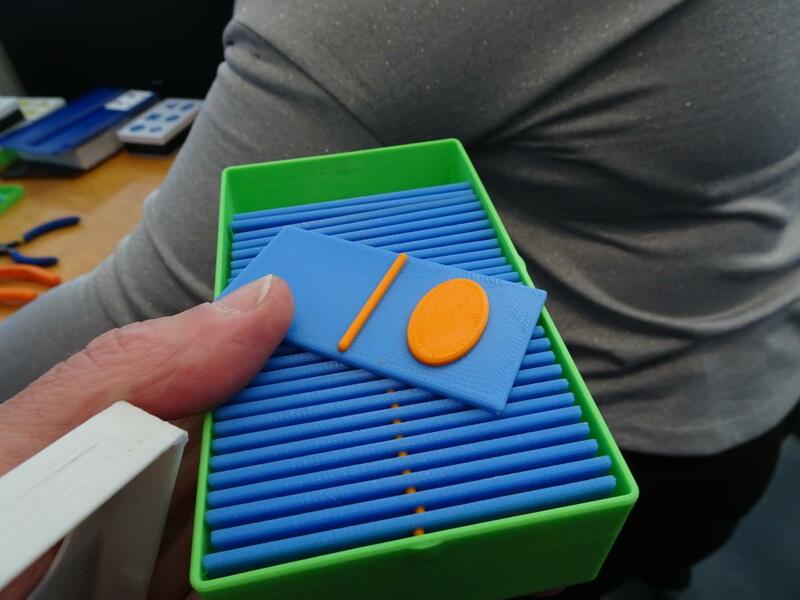 Other teaching aids will also be made available to blind children as shown in the picture. In Ukraine there is a blind association similar to our CNIB. It is very poorly funded. There is a residential facility in Rivne that has about 80 clients who are either blind or visually-impaired and have at least one other disability. These clients will benefit from the grant because of jobs that will be created. This will be done through the purchase of a tissue paper cutting machine which will allow the clients to produce toilet rolls for sale to local distributors. In addition, a small sewing facility on this site will be expanded by the purchase of new sewing machines, modernization of the sewing room, and a new embroidery machine for making simple uniforms with embroidered logos and names. There is a large cottage textile industry operating in Ukraine so clients will be taught sewing skills that should allow them to get jobs in this industry. 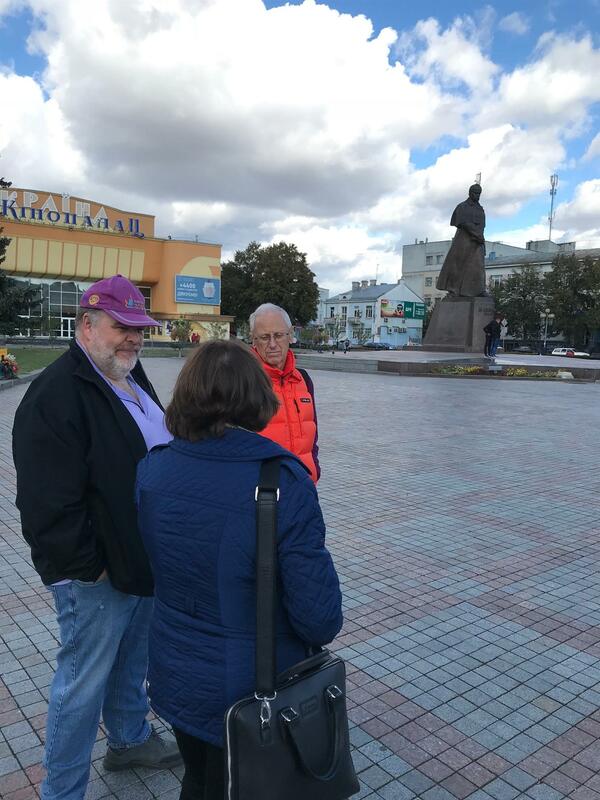 At least 6 Rotarians will be returning to Rivne, Ukraine this coming September to audit the project and find other opportunities to work with Rivne Rotarians and support projects that they will identify.